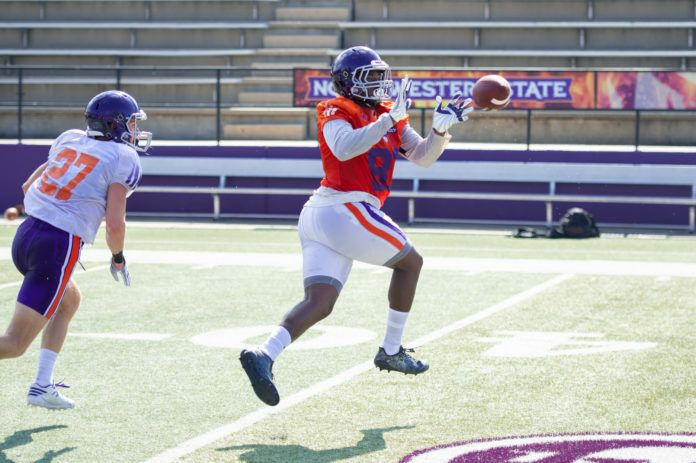 There was plenty of opportunity for all 105 Northwestern State players to make a good first impression Wednesday as new coach Brad Laird split the ranks and staged a pair of practice sessions. The Purple unit worked in the morning for 90 minutes, and the White group went for the same duration in the afternoon practice. There was a blend of starters, second-teamers, squadmen and newcomers in both workouts. “It’s a good mix. Everybody’s getting equal reps, so they’re not walking off the field thinking they didn’t get their share,” said Laird. “The newcomers get to see how the veterans go through the paces and that helps.